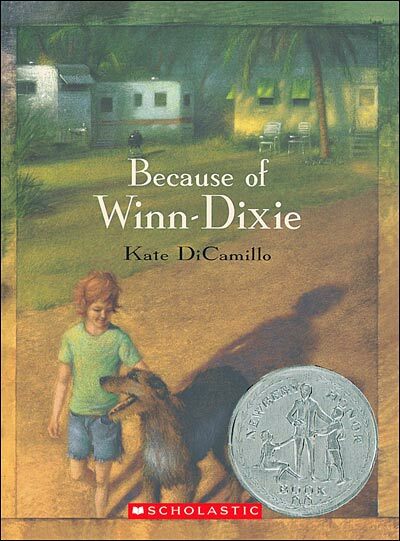 Because of Winn-Dixie is an engaging and sweet story about how a new dog helped a lonely, 10- year-old girl make friends in her new small town, build a stronger bond with her distant father, and learn to let go of the hurt she feels over her mother's abandonment. In the story, Opal finds a runaway dog at the local grocery store, takes him in, cleans him up, and names him after the store where she found him--Winn Dixie. In no time, the two are inseparable friends. With her new companion at her side, Opal slowly meets new people in her new town, each with an interesting story of their own to tell. DiCamillo weaves in each character's past into the narrative, creating a series of short stories within the novel and helping make the unforgettable cast of characters more real and likable. School Library Journal called Because of Winn-Dixie a "well-crafted, realistic, and heartwarming story [to] be read and reread as a new favorite." This book is for dog lovers, children who sometimes feel lonely, people who like a good story, anyone who has moved and had to adapt to a new environment... There is something for everyone in this heartwarming tale. Two thumbs up from us! Throughout the book, Opal thinks about what she would tell her mother if she saw her again. Have your student pretend to be Opal and write a letter to her mother telling her all about life since moving to Naomi, Florida with her father. Letters should focus on describing the people she has met and the experiences she has had, plus whether she likes living in Naomi more now than when she first got there (and why). Teachers will be able to sense the extent to which the student read and understood the book from the letter than they produce. Don't judge others by appearances. Don't believe what other people say about a person. "Some people have a strange way of going about making friends." "You can't always judge people by the things they've done in their past." Sometimes people aren't friendly because they are holding a lot of sadness inside. Elderly people often have some of the best stories to tell. Answers: (1) the dog's initial appearance, or really almost any character in the story, as long as it is explained as to why, (2) Stevie & Dunlap kept saying that Gloria Dump was a witch (3) the Preacher and Gloria Dump told Opal this about how Stevie & Dunlap were treating her, (4) about Otis being in jail, but could also be logically related to other characters, (5) Amanda Wilkenson-- about Carson, (6) Miss Franny Block, the elderly librarian who was always full of great stories. For artistically inclined students... Have students imagine a map of the town of Naomi, placing different places mentioned in the book on the map. Locations are NOT clearly specified, so the student can create the map however they please. Instruct the student to include 15-20 people, places, and events from the book on the map. A person can be shown in more than one place at a time (ie: Otis at the pet store +Otis elsewhere playing music on the street).